Epic Blend Premium Lip Balms are designed to be luxurious and long lasting. They glide smoothly on your lips for a superior lip care performance and offer cool packaging, great flavours and natural ingredients. Epic Blend are Petroleum-Free and some of them are vegan. Buy online at John And Ginger with free delivery and skincare samples with your order. Your lips are going to love you forever with this organic moisturising lip balm. Get total lip hydration, with a delicate shimmering radiance. Giving off a subtle hint of Merlot colour. Originally a Limited Edition Flavour to the collection which was so popular it has now returned. A super zingy wake up call for your lips, with the blend of zesty pink grapefruit and refreshing sweet orange. An organic coconut flavoured lip balm, to remind you of sandy beaches and swaying palm trees. An all time classic Cherry Lip Balm, that is super tasty with great hydration all day long. Give your lips a double kick of 100% pure peppermint and spearmint essential oils. This balm smells like a grapefruit slushy, without giving you purple lips and brain freeze. A calorie free fix for your lips with this vegan lip balm, with a delicious chocolate flavour. Get your lips looking peachy again with this super moisturising and super smooth Vegan lip balm. You will be on an aromatic adventure, with this berry flavoured lip balm. This amazing blueberry lip balm is super nourishing, and will quickly absorb deep in to the skin cells leaving your lips feeling loved. The refreshing scent of tangy raspberry and mellow pomegranate, will have you smiling with this lip experience. The scent will take you back to childhood and the memories of sipping root beer on hot sunny Sunday afternoons. Seven moisturisers are packed in to this moisture lip balm, and with a tangy scent of green apples its amazing. It sounds like an odd combination but put them together, and magic happens and your lips will love it too. Do Epic Blend lip balms contain gluten? Epic Blend doesn't use parabens or any other synthetic preservatives. Does Epic Blend you test on animals? No, Epic Blend tests on people not animals. Why the name Epic Blend? The name came up one day when the founders were talking about their balms and their ingredients, and just stuck. What is the shelf life of the lip balms? Epic Blend recommends using them within 1 year after opening them, but the shelf life is 18 months. Keep in mind that Epic Blend lip balms are packed full of natural and organic ingredients, so things like excessive or long term exposure to heat or cold can reduce the shelf life. 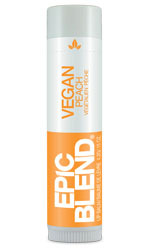 Does Epic Blend have any Vegan friendly balms? You Bet! Any of our Epic Blend balms marked 'Vegan'. Why doesn't Epic Blend add sweetener to your lip balms? Because sweet balms make you lick your lips, which dries them out. Why should I use Epic Blend lip balm? Because they work better than anything else out there! Epic Blend uses only top-shelf ingredients, like organic beeswax, organic coconut oil, and organic sunflower oil... And Epic Blend leaves out things like petroleum and synthetic preservatives. When start with the best ingredients you end up with the best finished product. Give Epic Blend a shot, you won't be disappointed.